Here is another activity to help kids memorize a scripture verse in a group setting. This one is perfect for longer verses and works best with a smaller group of kids (less than 15). Let me know what you think or if you have any new variations. Click here to leave a comment. Supplies: Large dry erase marker board with marker and eraser. Suggested Age: This activity works best for children who are confident readers. I’ve used it with some kindergarten children, but they will struggle on longer verses. 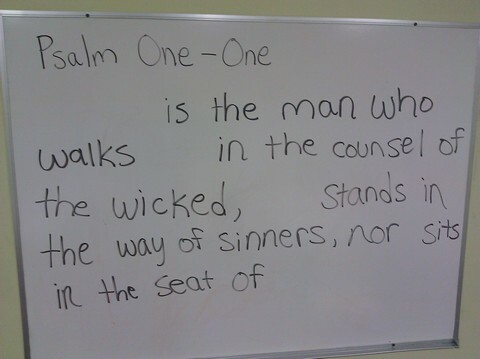 Procedure: After introducing the Bible memory verse, write it on the dry erase board. 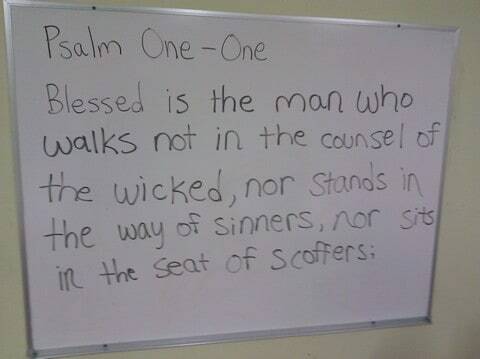 Have the children read the verse together. Then ask for a volunteer to read it aloud. 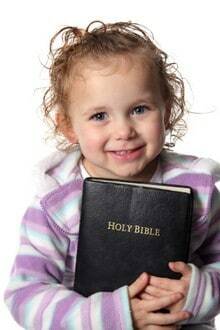 This child is then allowed to erase one word from the verse. Call on another child to read the scripture as it was originally written. Then allow them to erase a word. 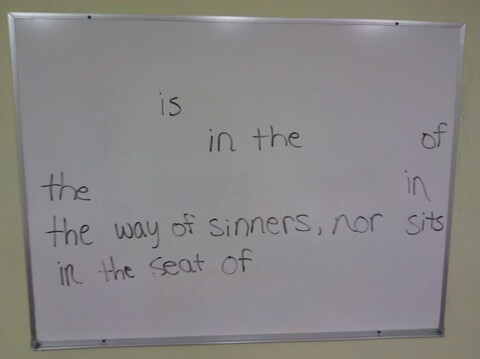 Repeat this process as the children remove more and more of the verse. This process makes the memory verse increasingly more difficult as the words are removed. It also keeps all the kids involved in the activity because they know their turn is coming. Other Variations: After they gain confidence, you can speed things up by allowing them to erase two verses after each time they recite the verse. I try to include adult volunteers in this activity, the kids always enjoy learning together with the grown-ups. This Bible memory game will be a favorite. I only use it on occasion to keep it fun. If the children struggle with the concept, you can replace each erased word with a blank line. This can help them remember where each word is missing. Alternately, you could replace key words with symbols or simple drawings. Tony Kummer (Editor) reviewed & updated this page on : January 17, 2011 at 9:52 am. All our content is peer reviewed by our readers, simply leave a comment on any post suggest an update.